Each year a number of top high school and college baseball players sign professional contracts and begin their journey through the Minor Leagues. On July 11, Michael Morris signed a professional baseball contract at Huntington Park in Columbus, Ohio. But Morris took an "unconventional" route to that contract: He is the Consumer Experience Manager for BUSH'S Beans. "We got jerseys and had our pictures taken," Morris said of the one-day contract he signed. "It was quite unexpected -- and a lot of fun. It was a great experience." 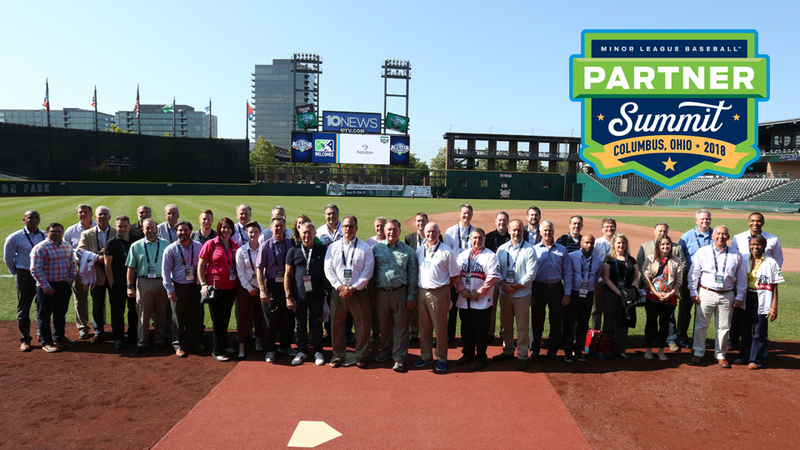 Morris was one of roughly 70 individuals representing 20 unique brands and agencies who took part in Minor League Baseball's 2018 Partner Summit, which was held in conjunction with the Triple-A All-Star Game. Those attendance numbers point to a step forward from the inaugural event last year, which saw some 40 different attendees from 12 brands participate. "I think the goal this year was to build on the success of last year's event -- and make it better," said Dan Migala, partner and co-founder of 4FRONT, which helped develop the Summit. "We had a larger group of influential attendees, especially from industry-leading brands and agencies that are current and prospective partners. "I think the difference between last year and this year is that last year we were able to tell partners and brands where Minor League Baseball is going, and this year we were able to show where it is -- and some of the successes of our partners while understanding there is enormous room for continued growth." Heather Raburn, MiLB's Assistant Director of Partnership Marketing, said the Summit helps sharpen the League's focus of creating value for strategic partners who are committed to Minor League Baseball's long-term growth. "One component of this summit is that it helps in building and cultivating relationships," she said. "Business is about relationships, and this event provides a forum for meaningful business-to-business introductions. "Second, the room was filled with top professionals that are leaders in a wide variety of industries, and the event helped us identify opportunities we might collaborate and share insights. "And the last was to have fun. That's what we do best: Nobody does 'fun' better than Minor League Baseball and we feel confident we showed all in attendance why It's Fun to Be a Partner." An example of that fun is BUSH'S Beans Home Run Recipes national contest. "The folks that run the concession stands for each club have a chance to create the most amazing, outrageous recipes using our beans," Morris explained. "Then fans get a chance to vote on the best recipe -- and the folks who vote on it get a chance to go visit the club that wins the vote." The Erie SeaWolves won the contest this year thanks to its Fiesta Burger, a third-pound beef burger topped with BUSH'S black beans, a slice of Pepper Jack cheese, bacon, guacamole, salsa and French's fried onions. This marks the second straight season the Double-A franchise in the Eastern League took top honors thanks to its 2017 victory with the Mojo and AC Rocket Dog, a combination of a hot dog topped with pulled pork, macaroni and cheese along with bacon. BUSH'S also sponsors the MVP awards for all of Minor League Baseball's All-Star Games, a collaboration that goes beyond honoring top players. "We also make a charitable contribution to the charity of choice for that player's club," Morris said." It's a way for us to recognize both outstanding performance on the field but also recognize the ways each club work in its community. "And a lot of the charities were food banks, which was near and dear to us as a family owned company that makes food. It helps us make sure people in need get the food they need." Migala feels the Partner Summit also gives Minor League Baseball a chance to connect business partners with its 160 member clubs, which blanket the United States, and the nearly 42 million fans who attended games last season. "It's an opportunity to tell the story of Minor League Baseball from a business perspective: where we've been, where we are and where we're going," he said. "We had a good mix of brands that have been with us and brands that feel Minor League Baseball would be a good investment of time and resources to come here and be in the room. "These organizations can become 'teammates' and work on different ways to sell product together." One example of that teamwork is the relationship developed by BUSH'S Beans and another partner of Minor League Baseball, Uncle Ray's Potato Chips. "Our food service team has been working closely with Uncle Ray's to develop recipes that can be used at concession stands," Morris said. "We have an 'Ultimate Nachos Recipe' [contest] involving their nacho chips and cheese along with some of our beans. "This event has been a great opportunity to play 'match-maker' and work together with other folks." Raburn said one measure of success for this year's Summit was the feedback she has received from those who attended the event. "A number of folks told us it was unlike any other partner summit they had attended before, which was an honor for us. We feel we've set the bar high, and we're going to evaluate where we can take this event from here."